Child Without Bed - Rs.16900/-Personal expenses such as laundry, telephone calls, tips & gratuity, mineral water, soft & hard drinks, porterage. Any increase in Airlines taxes or fuel price at the time of departure leading to increase in cost on surface transportation & land arrangements, which may come into effect prior to departure. Upon arrival in Delhi meeting our assistance then will proceed to Haridwar.Evening free for Ganga Aarti and other activities on your own. Night Stay in Haridwar. Early morning dip (bathing) in Holy Ganga and have blessings to start you journey for Chardham (Four Abodes OF God). After breakfast proceed to Barkot via Dehradun & Mussoorie. En route visit Kempty fall. Upon arrival check in into the hotel, rest of the day is at leisure. Dinner and overnight stay at hotel at Barkot. Late morning Drive to Uttarkashi after breakfast by 10 AM. Visit Vishwanath Temple before you check in to your hotel. Check in Hotel. Rest day at leisure. Night Halt. round trip With packed breakfast & post Tea/ Coffee leave for Gangotri early in the morning. Offering prayers & pooja darshan, later drive back to Uttarkashi , en route visit Gangnani & Harsil. Overnight stay at Uttarkashi. Morning drive to Sonprayag -Gaurikund (03 kms drive-one way). On arrival Gaurikund start your journey on the tough trek ahead. On arrival Kedarnath freshening up, perform Pooja and also Darshan at Shri Kedarnathji. This evening you can stay in Kedarnath Ji in govt provided camps or huts or in private accommodation like Guest Houses and Dharamshalas on your own or consult your agent. Pilgrims those are flying to Kedarnath Ji can come back and stay in your pre booked arrangement included in this program. Note : In our program your stay is booked for 03 Nights in Sitapur/ Rampur Or Guptkashi at base station of Kedarnath Ji. 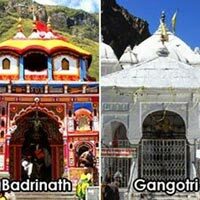 It is pilgrims personal choice how they prefer to go Kedarnath ji. Please consult your agent for further arrangements in Kedarnath Ji or Helicopter Tickets for the same. Morning after breakfast proceed to Badrinath via Joshimath & Pandukeshwar, (Narsimha Temple, Sankaracharaya Math) Badrinath. Evening Darshan & Pooja at Badrinath temple. Overnight stay at Badrinath. Early morning, pilgrims after having a bath in the Taptkund have the Darshan of Badrivishal. Brahamakapal is significant for Pinddan Shraddh of ancestors (Pitrus). There are other interesting sightseeing spot like Mana, Vyas Gufa, Maatamoorti, Charanpaduka, Bhimkund and the Mukh of the Saraswati River. Proceed to Rudraprayag O/N stay in Hotel in Ruddraprayag. After breakfast drive to Delh and departure to Airport or Railway Station according to your schedule. Early check in / late check out is subject to availability of rooms. In Chardham sector maximum hotels are preferring 12:00 Noon Check in & Check out timing. Vehicle confirmed will be as per Itinerary and not at disposal. AC will work only in the plains and will be switched off during hill drives. Specially for the Chardham sector Ac can work only in Haridwar & Dehradun’s plain / surface area. It is highly depending on the package you have opted. Any cancellation or delay in hotel check in due to third party services (like helicopter / pony / palaki ) , the retention will be charged. The next allocation for the hotels on same destination is subject to the availabilities. It is not advisable to travel in night, if necessary supplement charge applicable.